As a follow up to yesterday’s pictorial of Monticello, today’s post will provide a cursory treatment of the vineyards at Monticello. Please note that I have intentionally omitted as much discussion of Philip Mazzei as possible in this post since I have a lengthy article on Jefferson’s Italian friend next week. In the spirit of clearing up confusion surrounding Thomas Jefferson and wine, I feel it’s important to begin by stating that Jefferson never bottled a drop of wine from grapes harvested at Monticello. Though Jefferson spent several decades trying to establish vineyards and grow grapes at Monticello – vineyard diseases, weather, and wildlife conspired against him. I suspect his lengthy absences due to his political life also played a role. Thomas Jefferson took up residence in his beloved Monticello in 1770, and his first mention of vines appeared in a letter from his William & Mary mentor, George Wythe (Hailman, p. 372). No records indicate that the vines from Wythe were ever planted at Monticello. In 1774, vineyards were planted by Italian vignerons associated with Philip Mazzei. The vines planted in April 1774 didn’t last long as they were ruined by a severe frost just one month later. Further attempts to establish vineyards at Monticello were made over the next two decades. Though Jefferson was discouraged about the prospects of ever making wine at Monticello when he returned from his diplomatic service in France in 1789, he quickly regained his enthusiasm and reengaged in grape growing. * Legaux refers to Frenchman Peter Legaux (1748-1827) who lived outside of Philadelphia, a notable grape grower in the early 1800’s. The aforementioned list is abridged and does not include generic red and white grapes noted by Jefferson. Many of these vines came from Philip Mazzei and from the vineyards at the President’s House. It’s important to note that throughout Jefferson’s adult life, his notes indicate the receipt of vines from various associates. The years following Jefferson’s second term as President (1801-1809), the Scuppernong grape seemed to be the hot grape of the day (Sideways Pinot Noir anyone?). Jefferson’s Garden Book has many entries regarding Scuppernong, including the receipt of vines, attempts to grow, and the scuppernong wine grown by others. His last entry regarding Scuppernong was in June 1823, three years before his death. Though Jefferson was never able to produce even one bottle of wine from any of his plantings, the vineyards at Monticello thrive today. The restoration of the grounds at Monticello began in 1977. From archeological excavations and detailed study of Jefferson’s Garden Book, vineyards at Monticello were replanted in 1984 at the same northeast and southwest vineyard sites Jefferson planted his vines two hundred years earlier. 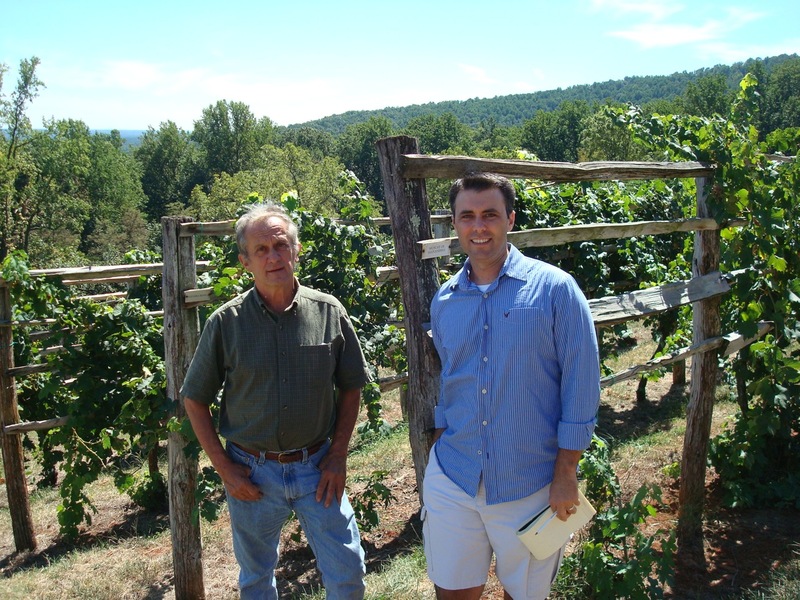 I recently had the chance to meet with Gabriele Rausse, the man responsible for the vines at Monticello and making wine from the grapes. Gabriele is one of the early pioneers in the Virginia wine industry – coming to the Charlottesville area nearly 35 years ago. In good years, the Monticello vineyards can produce up to 1,000 bottles of wine. Unfortunately, the vineyards at Monticello have produced less wine in the last few years due to a vascular disease that has affected the Sangiovese. I don’t feel that Thomas Jefferson’s vision was unfulfilled – rather it was delayed. No doubt Jefferson would beam with pride with the current state of the US wine industry and our prominence on the global stage. I think he would be especially proud of the Virginia wine industry – Jefferson’s home state is now home to over 150 wineries, including six American Viticultural Areas (AVAs), and is the 5th largest wine producing state in the US. He would likely be a regular visitor of the Monticello Wine Trail that includes over 20 Virginia wineries in close proximity to Jefferson’s home. Meeting with Gabriele Rausse at Monticello. Jefferson on Wine, John Hailman. Dezel: Thanks for the comment! You raise one of the MANY debatable facts of Jefferson’s life. Referencing two of the most authoritative books on the subject (Hailman’s ‘Jefferson on Wine’ and Gabler’s ‘Passions…’) as well as interviews at Monticello, there is no reliable, factual records indicating that Jefferson ever made wine from grapes grown at Monticello. Though Bowers appears to be referring to some specific correspondence saying Jefferson actually produced wine from native grapes at Monticello, there is currently no evidence (Jefferson’s writings or otherwise) that support this assertion by Bowers. In ‘Thomas Jefferson on Wine’ Hailman notes that this reference is more likely referring to wine made from wild grapes on the property by Philip Mazzei. This alleged wild grape wine would have been sent to Williamsburg to generate interest in The Wine Company.